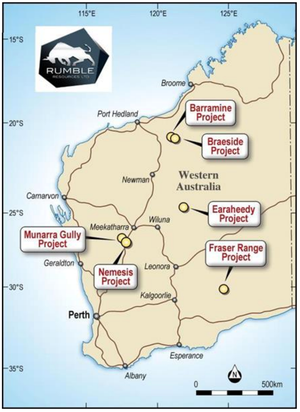 Rumble Resources (ASX:RTR) has provided a quarterly update on its activities across its portfolio of projects in Western Australia. The company has six projects spread across the state in various stages of exploration — these are the Braeside, Barramine, Munarra Gully, Nemesis, Earaheedy, and the Fraser Range projects. 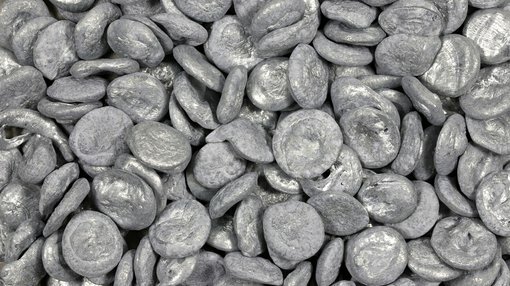 Most of the activity during the quarter was focused at the Braeside Project — a high grade zinc-lead-copper-silver-vanadium project in the Pilbara region. Following the discovery of the Devon Cut high-grade zinc mineralisation with RC drilling November 2017, the company has been aggressively exploring systematically using surface geochemistry to delineate high order targets ready for an upcoming RC drilling programme. Grab sampling and XRD analysis completed during the quarter is aiding in prioritising first order RC drilling targets. Multi-element assaying (201 grab samples) and XRD analysis focused mineralised trends determined by regional soil geochemistry with detailed pXRF which highlighted 15 base metal zones, hosting up to 23 targets. Following this geological mapping and detailed sampling completed RTR will begin drilling in early August. Also during the quarter, RTR partnered with the CSIRO to investigate the alteration mineral footprints at the Braeside Project. CSIRO and Rumble will undertake research into the wide pervasive alteration zones associated with base metal alteration at the project. The collaboration will involve processing and interpreting spectral data by CSIRO to aid in defining alteration signatures associated with base metal mineralisation. Importantly drill hole spectral studies completed by RTR have confirmed the widespread alteration. Rumble has received a $50,000 grant through the Australian Government’s Innovation Connections programme, to be matched by its own funds to execute the project. 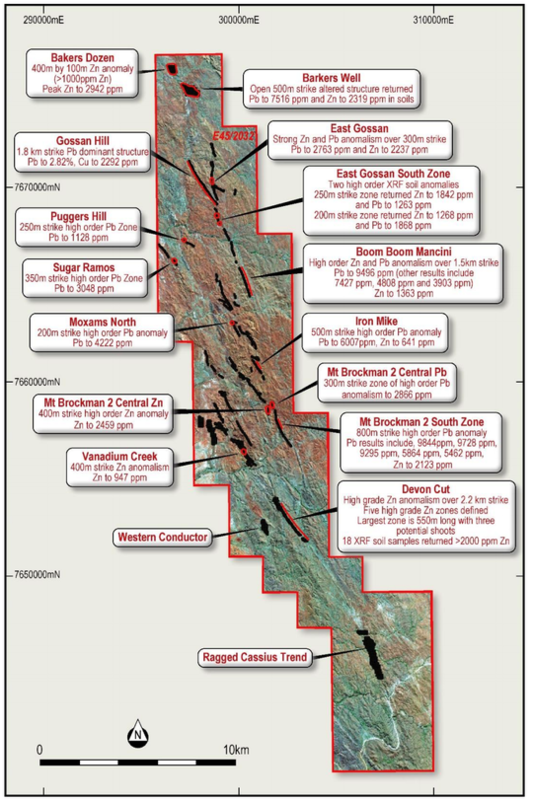 RTR’s Technical Director Brett Keillor said, “Rumble has over 1000km2 of prospective tenure, much of it exposed and suitable for spectral mineral mapping. CSIRO is the premier organisation in Australia with respect to the application of spectral research to exploration. The collaborative study with CSIRO will gain an understanding of the mineral alteration and mineralisation relationship that may lead to significantly expediting generation of high order targets for further geochemistry and possible drill testing”. 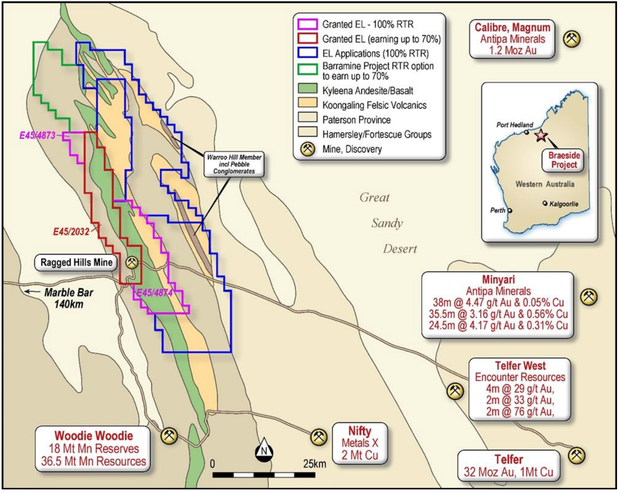 This quarterly report comes just days after RTR announced that it has successfully completed stage 1 of its RC drilling program at the Munarra Gully Project — a high grade copper-gold project. A large first order conductor was identified, with assaying of the samples expected to take approximately three weeks. The results from the drilling will be reported as soon as assay results are available. RTR exercised an option agreement to acquire Pilbara region high grade copper-lead-zinc-silver project, Barramine in April. The company is set to conduct maiden exploration at the base metal project later this year. At the Earaheedy high grade zinc project, geochemical sampling has been completed. The company is now awaiting assays and have scheduled drilling to commence in September. RTR also completed drilling at its Nemesis Gold Project during July and is awaiting assays. Exploration is also ongoing at RTR’s Fraser Range nickel-copper projects, as part of its joint venture with Independence Group (ASX:IGO). The company is in a strong cash position with $3.8 million cash in bank and is fully funded to complete the upcoming exploration and drill programs.